Do you want to add the “WOW” factor to your next event? We tell you how! Custom event lighting for your wedding or any special event is one of the most determining factors in creating a beautiful atmosphere. A truly distinctive and original way to capture the beauty and memories is using the proper lighting. Sean Garrity Events and Production provides lighting design for corporate events, weddings, bachelorette parties and any occasion you may like. Whether your concept is high-energy, dynamic lighting, serene visual landscape, or colorful displays, we are sure to to give you what you have dreamed for that special day. Our Décor Lighting is ideal to add more ambiance to your next event. For example, wedding receptions at any location or under a tent will dramatically enhance and make it look special. 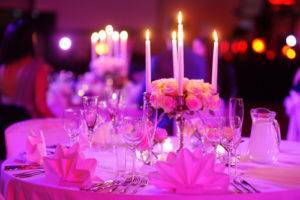 We can highlight your table centerpieces, dance floor, inside or outside of the tent according to your party theme. Enhance your DJ or Band at your next event with club style lighting on the dance floor, and you will have everybody dancing until the next morning. We provide general lighting for all your needs that include automated, LED, rope, spot, architectural and concert lights. We are an event production company with many years of experience in the entertainment business, providing quality service to all our clients and working one on one with them to fulfill their expectations and to capture their ideal vision into a reality. We provide disc jockey services, photo booth rental, custom lighting, hosting and EMCEE services. We are pleased to help you with any consultation regarding your event or party, to assure you are 100 percent satisfied with the results. Check our event pictures and testimonials for any other ideas and inspiration for your next event. Call us today at 954-464-5900.